This is When’s Melee, your weekendly preview of streamed Melee tournaments. 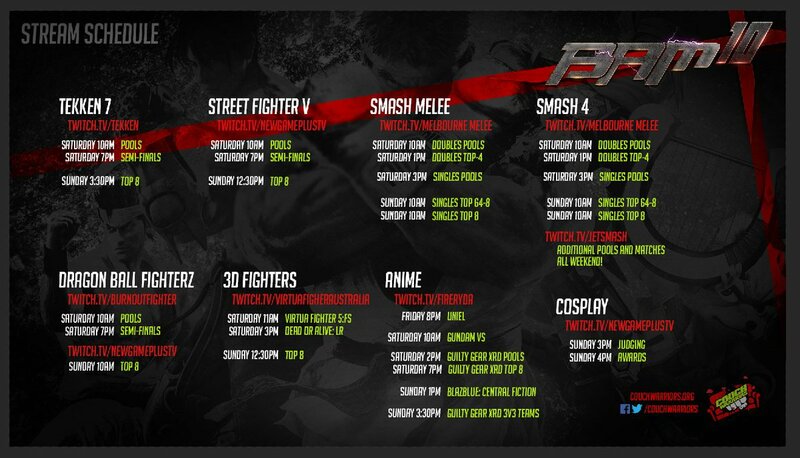 If you know of any other streamed tournaments not on here (excluding weeklies), please give the relevant info on Twitter or here in the comments. Starting next week, When’s Melee will be hosted on meleestats.co. It’ll still be the same article, just on a site that produces other content. Thank you to Tafo for letting me use the MIOM platform. Featuring: Hungrybox, Plup, Mew2King, aMSa, Axe, Zain, SFAT, Lucky, Crush, HugS, n0ne, Shroomed, Duck, Westballz, Swedish Delight, PewPewU, lloD, KJH, Ice, Ginger, La Luna, Ryan Ford, Rishi, Amsah, Moky, Legend, Kage, Slox, Trulliam, Sharkz, Crunch, Jamrun, Plum, Heartsrings, Tranimal, and more players from all around the world in this big ol’ Canadian battle. Featuring: Armada, ChuDat, Spud, Sora, SA Nick, Zxv, Rainbow, Quetz, sundowns, SD, DonB, MC, Dekar, and more of Australia’s best. Featuring: NMW, Ralph, Umarth, DiplomaticTucan, Azel, Kevbot, L, Rymo, Wavebringer, Arcadia, and hopefully more of ranked and formerly-ranked NorCal. Featuring: Nebbii (formerly)Avalancer), Kellner, Däumling, Schlimmshady, and Jeapie in doubles and crews. Top 8 on Sunday. Featuring: Probably a lot of the New England PR. Sam “’Cathy’ (because ‘Ack’ (because ‘heart attack-ack-ack-ack’ (because Movin’ Out (because the article is changing websites))))” Greene can be found on Twitter @SSBMDingus.